There are so many factors that go into a project like a Waynesville log home restoration project. Savvy locals already know that the name to entrust, for this type of service work is Taskmasters Wood Maintenance. We take great pride in the work that we do and that is evident from the high customer satisfaction rating we have earned. Our impeccable reputation as a North Carolina log home restoration company is built upon a foundation of superior craftsmanship and exceptional customer service. Having the ability to help homeowners restore their original log cabins is an honor and a privilege. Whether you have a historic rustic or a modernized home, the workmanship that was invested into the initial build is what it is really all about. Let us provide you with the quality workmanship that you want, need and deserve so you can take the best care of your home possible. Even if you are only a part time resident or are using this as a rental investment property, you are going to appreciate the results that we can deliver for you. Call now to get started. Decks and Docks – Adding these wood built features to your home will help make it more enjoyable, as well as increase the overall property value. We promise you the finest in quality work and overall final results. Painting – Painting the exterior of your home makes a world of difference for appearances and for protecting the overall condition. Don't put off getting this service need addressed for too long. Soda Blasting – In order to remove certain coatings, or provide an overall clean, a popular method to use is soda blasting. This is a gentler alternative to sand blasting yet provides results that are just as effective. just to name a few! Waynesville's Number One Wood Restoration & Pressure Washing Service Provider Taskmasters Wood Maintenance is also proud to offer services like wood restoration and pressure washing. Restoring your wood is essential for improved performance and optimal longevity. The pressure cleaning we offer will revitalize the look of your wood without causing damage. Make the wise decision to partner with our team and let us provide you with workmanship excellence. We care as much about the results of your restoration project as you do, if not more. Get in touch with us today to help get the results that you hoped for. 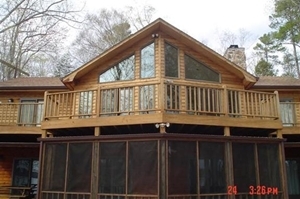 If you're looking for a professional for log home restoration in Waynesville, NC, then give us a call 252-266-9457 or complete our online request form.